Productivity is as crucial as it is elusive. We all have days where we just can’t seem to focus. Your mind wanders, your fingers seem to automatically take you to YouTube and your work goes ignored until the last half hour of the day – which isn’t good for anyone, and so has led many to seek out tools, methods and tricks to overcome the curse. Sometimes it works, sometimes it doesn’t. But these six charts address the issue. The internet and smartphones are constant sources of distraction for us. Whether it is reading email, checking a social media profile, “networking” with work contacts or just chatting, it can seem an impossible task to block it all out. 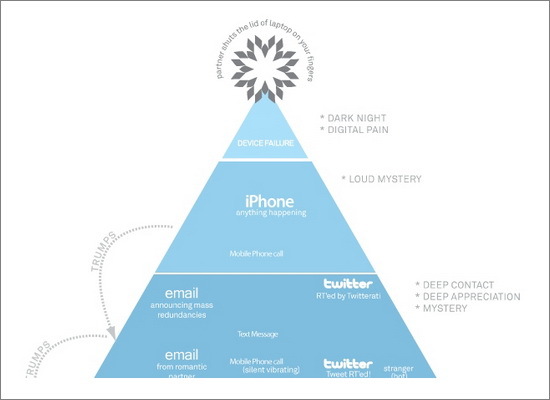 This amusing pyramid chart was created to show the worse possible forces that keep us from dealing with our work. It includes email, LinkedIn, Twitter, Flickr, text messages, online dating messages and more. Is it any wonder productivity is taking such a hit these days? 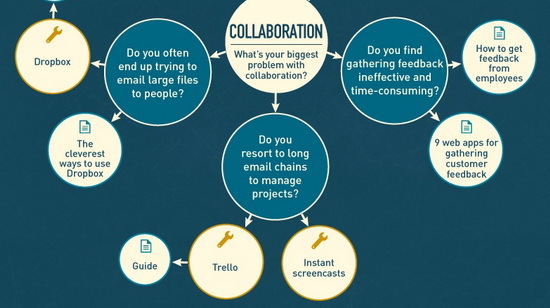 This chart follows the work process of blogger Julien Smith. He spent a day studying his own method of staying productive, and created an easily internalized flowchart that shows how he manages to be so effective in his own schedule. It is both amusing and helpful, and it is easy to see why it works for well for him. 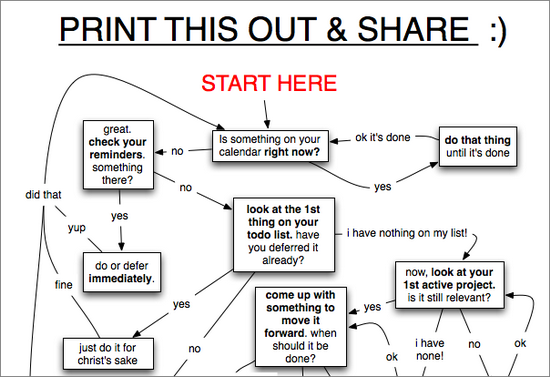 I think if more people followed by this plan, they would manage to get a whole lot more done. Especially since a lot of it seems to be based around the “just do it” attitude. Which is allt hat works for us, sometimes. Stress will always heavily factor in to your level of productivity. We have each felt the mid-day panic when you realize how behind you are and how much time you have wasted that day. For some of us, it is a daily occurrence. This chart looks at how this effects your work, and while it is funny it is also true. You can pinpoint a number of places where you could benefit from reducing your stress, calming down and focusing. 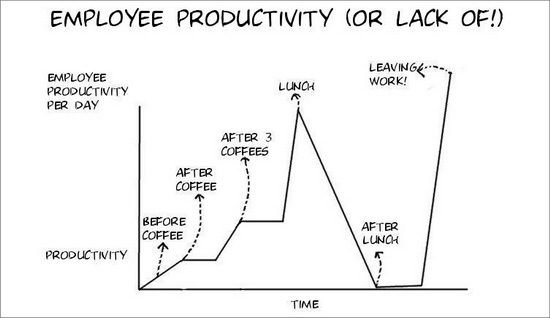 This is actually an entire series of charts dedicated to different elements of productivity in the work place. It includes topics like productive meetings, collaborative projects, reducing the time spent on email, planning to boost productive work ethic and more. These are so seriously helpful guides that you should definitely keep around and share with others within your workforce. 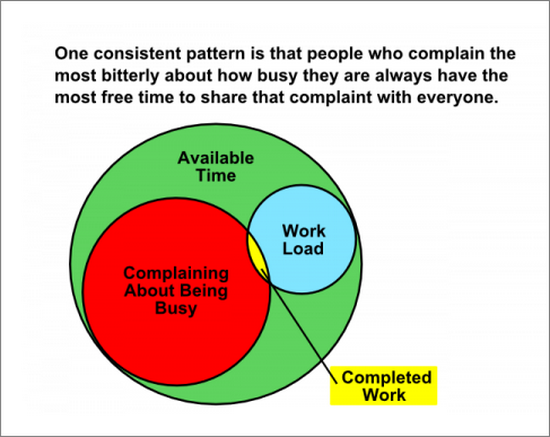 Have you ever noticed that the people who complain the most about being busy seem to have the most free time and get the least done? You have seen this time and again in offices, where coworkers will just mingle and laze about, whining about the workload that someone they never seem to be working on. Whereas, those who are actually swamped are too busy working to complain. This diagram is based around the same rule of thumb. What makes you productive? A cup of coffee? Some soothing music? A looming deadline that causes massive panic until your are working so hard your eyes bleed? 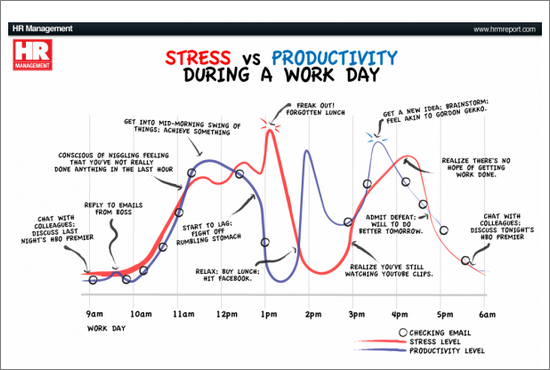 This funny graph looks at what factors make workers productive, and the times of the week they are most likely to get things done. Such as when the CEO is visiting the office. Have a graph you would like to share? Comment with a link and let us know!